Coming from the team that brought you Bastion, Transistor is another superb sci-fi action game which provides plenty of exciting tactical real-time combat and packages it with stylish visuals and a gripping, minimalist storyline. The game finds you in control of a 1930s-style lounge singer who has lost her voice and who wakes up in the city of Cloudbank in possession of a talking sword. As you explore, you'll discover the truth behind the terrorist faction that is laying waste to the city, while acquiring new abilities which will help you overcome the myriad enemies you'll face. The whole thing is told in super stylish fashion, with most of the action unfolding via an isometric view but with other perspectives also used to tell the gripping story. There are plenty of customization options too, with thousands of possible combinations for your weapon and which give the game some real depth and variety. The combat plays out in real time but offers huge amounts of strategy and this too elevates the game to another level. 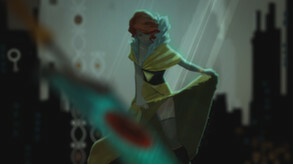 Transistor really is a stunning game. Right from the start, the incredibly stylish visuals captivate the gamer with their vibrant use of color and stunning design work. The world created here is frighteningly plausible but fascinating to explore, while the combat is fast, furious, intense but satisfyingly deep. The story too is well crafted and doesn't rely solely on cutscenes to tell the tale, making the game feel truly interactive and not just like watching a movie. Really, if you just like good games, then this should be part of your collection.